Erin Katz, a fifth-year Drexel University Chemistry program senior, found herself cooking two Thanksgiving dinners in a manufactured home in Texas in June; all for science. Katz was participating in a large and unique field experiment as part of the project HOMEChem, which stands for House Observations of Microbial and Environmental Chemistry. The study marks a landmark undertaking in the relatively new field of indoor air chemistry and related studies. HOMEChem is a field-study research program which ran over this summer from late May to early July of 2018. The project is the first of its kind in the field of indoor air studies at such a large scale. Over 20 research groups from 13 different universities were recruited by principal investigators Delphine Farmer and Marina Vance, and were awarded funding by the Alfred P. Sloan Foundation in 2017. Peter DeCarlo, Drexel associate professor and head of the Drexel Air Resources Research Laboratory, brought five analytical chemistry instruments and four researchers with him to the field study — including Katz, the only full-time undergraduate student researcher of roughly 35 researchers on-site for the extended study. Other groups were invited to participate by Farmer and Vance based on areas of expertise, instrumentation available and related fields of study. Although Americans spend an estimated 90 percent of their lifetimes indoors, most air quality research done until recent years has only focused on outdoor air quality, to provide data which informs the regulations of outdoor air quality by the EPA. However, indoor air quality has never been regulated in the ways that outdoor air has been, and until recently funding for scientific inquiries of indoor air has been scarce. The funding for HOMEChem and other projects related to indoor air quality studies has been provided most recently by the Chemistry of Indoor Environment science network under the Alfred P. Sloan Foundation, which comprises a multi-million dollar research funding program. Of these projects, HOMEChem is the first field-study to take place under the CIE program. The quality of our indoor environments is an incredibly important field of study, according to Katz. “Most of our exposure to outdoor pollutants happens indoors. Everything that’s outside is coming inside, that’s where you’re breathing it. Your house is not a perfect seal,” Katz explained. She explained how we pay attention to the health effects of outdoor air, but our exposure is magnified indoors, where closed doors and low ventilation contribute to increased concentrations of harmful particulate matter and emissions from cooking and personal care products. Targeted chemical species measured in the project included three groups of highly reactive or unhealthy species: oxidants, volatile organic compounds and particulate matter in the size range of 10-1,000 nanometers. The compounds in the study are related to human health and air quality, but the focus is not yet on the health sciences. “The focus of this project is actually just the chemistry. We’re not here to say ‘this is bad, this is good.’ This study is meant to open up the can of worms and say: what are we measuring in this house, and then what should we do from here? Because if you don’t know what’s there, then you can’t take action,” Katz said. The field study took place in the UTest House in Austin, Texas, built specifically for the purpose of studying the dynamics of energy, air flow and chemistry inside a 1,200-square-foot manufactured home. This house is one of only a few in the world dedicated to studies on indoor environments. 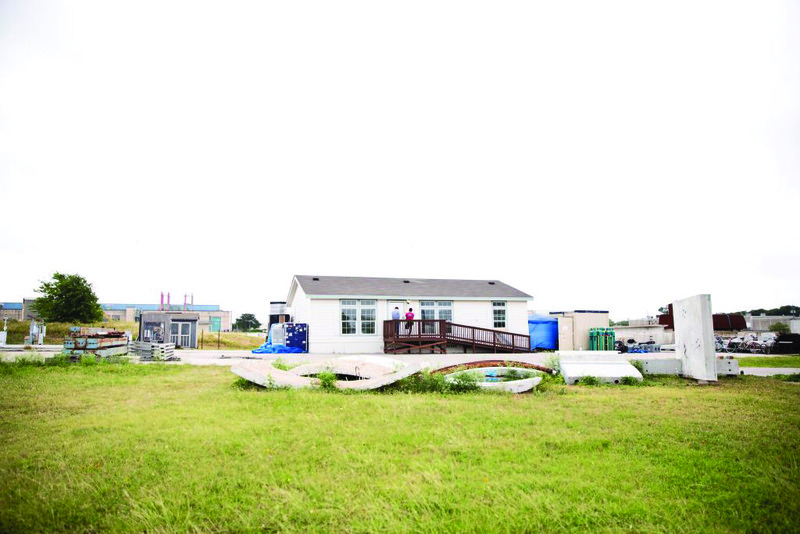 The researchers in HOMEChem began the field study by outfitting the test house with tubing, valves, sensors and inlets that carried air samples to several sophisticated analytical instruments, housed in four different trailers built around the home. The several vacuum pumps for the instruments were housed in the affectionately named “Hot Pump Alley,” a shelter constructed by the HOMEChem scientists prior to data collection for pumps which produce too much heat to be stored in the instrumentation trailers. Measuring the chemical composition of the gases, droplets and particulate matter in the air inside the home is not an easy task, and the researchers were responsible for daily instrument calibrations, maintenance of the home to ensure consistency across variables, instrumentation repair and troubleshooting, tubing leak identification and repairs and more. Setting up the field-study environment — placing sensors and tubing in the test house, connecting all inlets to the instrumentation in the four trailers, supplying power, and getting the pumps in a shelter to keep them dry and cool — took a week. Focuses were cooking, cleaning and occupancy, and researchers were charged with completing several indoor tasks to mimic activities in a real home. Researchers were expected to wear a “normal” daily amount of personal hygiene products, cook stir fries and other meals in exact replications, clean the house with different types of chemical cleaners, and sometimes just hang out inside the house, sitting down and chatting. Researchers might even volunteer for a “sniff test,” explained by Katz as standing directly in front of some of the instrumentation inlets to allow body odors, perfumes, deodorant scents and other chemical emissions from their bodies to be directly analyzed by the instrumentation. The hope is to study the types of compounds present in an indoor air environment which closely mimics the average American household, in order to begin understanding the effects of indoor air pollution on our quality of life. However, in order to start accumulating research and data about indoor air quality, funding is needed. HOMEChem is the first largely funded undertaking of indoor air studies, though it’s hard to say if more funding for indoor air environments will be provided by the government in light of the HOMEChem project findings. “The indoor air community is lacking a lot of crucial information to get more funding. It’s a tough situation — what is the government going to do, regulate your house? People don’t want that,” Katz stated. All activities were logged precisely by researchers including an exact start and stop time for all measured events to be compared with the 24-hour data logs later on. Outdoor air data was also collected at frequent time intervals along with indoor air data to compare the trends across the environments. Now, the field data is to be processed by the several groups and universities who took place in the study to begin compiling sets of data, searching for trends and publishing highly-anticipated results. The team preliminarily found that concentrations of particulate matter, which is known to be extremely detrimental to human health at high concentrations, can be up to 10 times or more concentrated during cooking events indoors as compared to outdoor levels. Katz also explained that when carbon dioxide levels rise, humans become lethargic, which is why it’s so important to keep ventilation in office buildings and classrooms high. Outside, carbon dioxide levels are normally around 400-410 parts per million, but inside you can see much higher concentrations. The researchers found concentrations up to 4,000 parts per million of carbon dioxide inside during their Thanksgiving Dinner cooking events. As HOMEChem scientists continue to extract conclusions and new understandings about the indoor environment over the next few months, many hope to publish new and important findings that have never been explored in the field of atmospheric and air chemistry. To follow the progress of the study, you can track the group’s Twitter account @IndoorChem or by following #IndoorChem.